The artist is balancing a video-camera on a tripod the top of which is poised in the palm of his hand. The lens of the camera is directed downwards so that it acts the part of witness and hostage of the action at the same time. 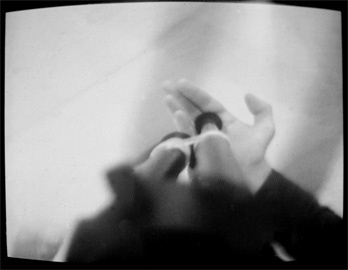 Although the camera, together with the hand holding it, is keeping moving, it is seemingly staying still, and the floor the author is standing on appears to be sliding away. The video lasts as long as the artist retains the control over the equilibrium of the camera.